My mother is worried on account of me only having one t-shirt. Every night when I shower, I wash the shirt, and then put on the wet shirt. My mother is pushing me to get another shirt, at least until my trip starts. How could I only have one shirt? It seems indecent and she suspects I smell. I got an email from Corrado, who’s in charge of the L.N.I. 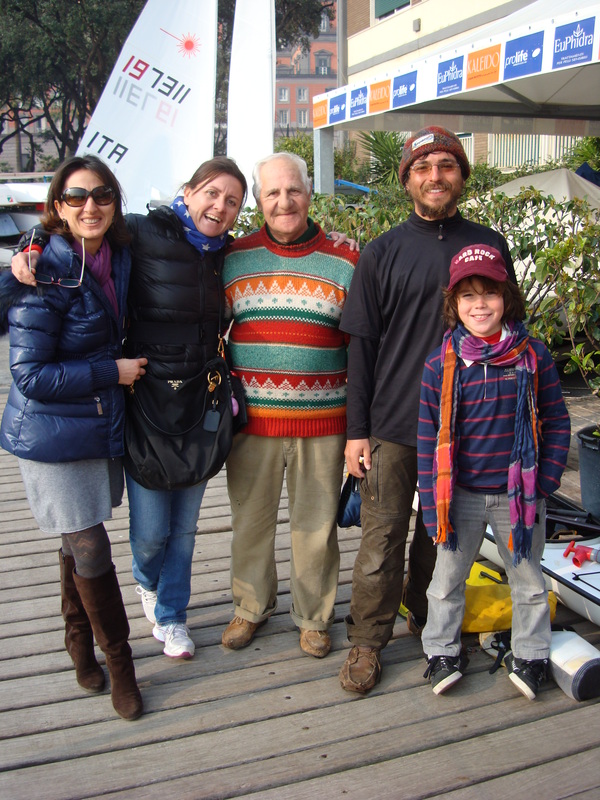 Napoli kayaking program. He invited me to teach the group. And the next morning I showed up for just that. On such short notice, I had a class of one. After showing me around, Corrado and I went for a paddle. We passed the same castles and coast I had finished my trip with so long ago, except this time I had a running narration. Buildings that had called out to me “I’m interesting,” only to remain silent, now revealed their secrets and ports told their histories. We arrived at a harbor used by a kayaking club and looked around for the local kayakers. Corrado thought they would like to meet me. There was a rack holding some nice looking boats, but we couldn’t find any of the paddlers who owned them. On the way back, we paddled through a tight rock garden just underneath a castle on an island. A wall separated a maze of stones and narrow kayaking passages from the castle, and it was an enjoyable test of skill to paddle through smoothly.. In the distance, I could make out the island of Capri and the enormous Mount Vesuvius. The weather was nice and I rolled for the love of it. Corrado thought it was cool so I agreed to teach him how. We were back on Sunday, ready for rolling class in the crystal clear green water of the sailing club’s port. We only had one sprayskirt between the two of us. I decided I would try to teach Corrado a layback roll. I would perform various demonstrations in beginning, then Corrado would take the skirt and we would would see what he could learn. I prefer to teach the C to C roll to first timers because since it brings the paddler directly into a stable upright position. But I think a layback roll may be more forgiving so long as the paddler can get his head down against the stern deck, and may be preferable for Corrado since he may not be as limber as was when he was younger. “Corrado, can you get your head down against your back deck?” I asked. He tried. He got his head pretty low before he capsized. Good, he could do it. He started to swim to the dock but I wanted to teach an assisted rescue whereby a kayaker gets back into his boat with the help of an assisting kayak rather than a dock. 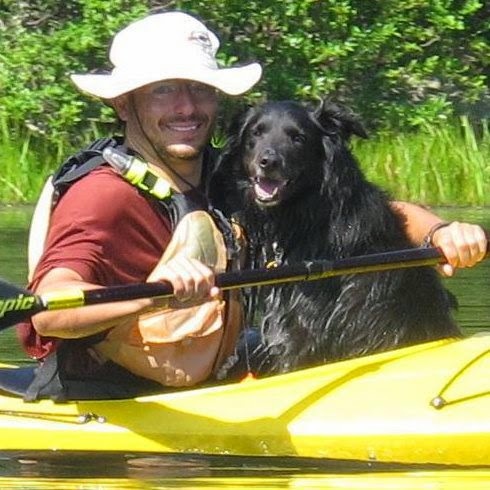 Corrado has been kayaking for over 30 years. He is eager to learn, but not good at following instructions in a foreign language*. We got him back into his boat with only a few worrisome moments. Among other things that were new to him, I was pleased explain to him that you can get almost all of the water out of a kayak just by lifting the bow. With a bulkhead just behind the seat it was not necessary to take the boat out of the water and rock it back and forth as he thought. When he capsized a second time, the assisted rescue went as smooth as good scotch, which was sadly unavailable. Ready to move forward, I demonstrated a layback roll. “It looks easy,” he said, pleased that it was so simple. I break the roll down into three main components: Sweeping the paddle way out at a climbing angle from the bow to the stern gives leverage against the water. Bringing the left ear from being scrunched against the left hip to right ear against the right hip pulls the boat under the paddler. Finishing with the head as close to the back deck as possible keeps the center of gravity low, making the whole thing easier to pull off. I went on to demonstrate how to learn the ear hip scrunch with a bow dip. To perform a bow dip, I explained, you hold onto the other kayaker’s bow while resting your ear in the water. Since, like Grandpa Sam ז”ל**, it was the only ear Corrado could hear from, the rest of the technique didn’t go so smoothly. I explained the whole thing from the beginning, this time without insisting that he follow my instructions as I go through them. He tried and then we did it again, and again. We got to where he was switching from a right scruntch to a left scrunch and pulling himself out of the water almost without his arms. It was great. He had learned the technique, and while he didn’t get it right on every attempt, he could tell on his own which attempts were good and which were not. We’ll work on sweeping tomorrow. Corrado went off to a meeting and I had the boat and the Gulf di Napoli to myself. I paddled to the sea caves and islands that I remembered from the last time I was here, years ago. This time, I wasn’t finishing a 1000 mile expedition, I was just exploring. And explore I did. I went deep into mountains. I skirted barely submerged rocks. I took lots of pictures. I rolled to cool off. And I waved to other kayakers who sometimes waved back or smiled in return, and sometimes ignored me. As I paddled back to port, I watched Capri. In the afternoon sun, it was a lazy shade of purple on the horizon. 15 nautical miles out, I’ll spend the first night of this leg there, and hopefully explore the mythical Blue Grotto. In the port, a fellow from L.N.I. gave me a t-shirt. Now I have two. When my trip starts, I’ll give it back, but in the meantime it makes my life a little easier and my mom will be pleased. *I suspect that, like me, he’s not good at following instructions in any language. I really like the guy. Nelo called me. They needed an address to ship the kayak to. It could arrive in Naples as soon as October first. All I needed was an address. I hoped to use the Lega Navale where I finished the first leg. (40.834912,14.252925) I remember the place. I remember the park next to it. And I can find it on a map without thinking twice. It was the place where I put down my paddle to go back to school. It was the place which I vowed to return to. About a week, earlier I had emailed the sailing club and asked if I could use their address, but I never got a response. I did two things: I emailed my old friend Massimo who helped me a great deal on the Barcelona Napoli leg asking if he could speak to the league on my behalf in Italian, and I got on a train to Naples to talk to them myself. The train cost 14 euro. I sat next to a young couple from Australia that was touring Europe. They thought my adventure sounded cool. You should too. I knew that my ticket was supposed to be stamped, but I wasn’t sure how to do it or why. I asked them if they understood the bit about stamping the tickets. The Australians had no idea. They had unstamped tickets like I did. Oh well, I decided not to worry about it and read my book. The train sat in the station waiting to leave. I looked at my watch. The train should have left a couple minutes earlier. I jumped off the train, got the ticket stamped, and was back on in before it left. In fact, about five minutes before it left. The train ride was nothing like the one in Trading Places. In Naples, with my enormous duffel bag on my back and my storm paddle in hand, I navigated the subway system to my hostel. I did not leave my duffle bag anywhere it might get stolen; I just lugged it. I arrived at the hostel, put down my duffel bag, and rested for a few minutes. I got a map from the reception, pointed at the spot that I thought was the Lega Navale, and asked the receptionist, “There’s a park here, right?” I remembered that there was a park next to the marina. “It’s near a castle that tourists like, right here,” he said, pointing at the map. And I went. I walked through the narrow corridors of the city. Five story buildings with peeling paint towered tightly over the small cobblestone streets. Small balconies looked out from every home with laundry hanging to dry. Scooters rushed along and sometimes even a car would manage to fit through. For half a euro, I bought a can of chickpeas. The can was self-opening with a little metal tag. I pulled the tag up and it came off. I looked at the can for a while, hoping it would slip me some clue on how to open it. Short metal poles coming up from the cobblestones separated the narrow street from an impossibly small sidewalk. I found a spot that wasn’t in front of somebody's door and whacked the can onto the top of the poll. I examined the the can, and there was now a big dent in the top of it. The pole was impervious. I tried a few more times and added a few more dents. If only I had a knife. What were my assets? No holocaust cloak, but I did have a one euro coin. I pressed it hard against the line near the edge of the can top in one of the indentations. I pressed it harder, and it opened. A fountain of sticky canned chickpea juice erupted into my face and hair, then died down trailing onto my shirt. I used the dry part of my shirt to wipe my face off, and then, after a moment of reflection, resumed my walk while munching chickpeas. Soon I was in the touristy section. The paint stuck to the buildings and I walked on a wide designated pedestrian avenue. There was less litter on the streets. Pizza and ice cream places revealed tables crowded with patrons and counters laden with tasty Italian treats. Large windows displayed cases of jewelry or the latest trends in Neapolitan fashion. After a half hour walk, I saw the park. I walked down and it was just as I had remembered, only with more details and litter in real life. On the other side of the park was Lega Navale and the marina, also just as I remembered. I looked around and sacred memories melded with my vision: The port, the sailboats, and even the exact spot I had rolled out of my kayak onto the dock. Here is where I finished the last leg; here is where I will begin the next one. I went into the building and even the bathroom was exactly where I had remembered, and that was the best part of all. I came out of the bathroom greatly relieved and a little bit cleaner. My hair was sticky from dried chickpea juice. I looked around the building. “Yes.” She waited to hear me. Ricardo, her small son wandered nearby. “No, but I am a member. This is a club.” She was a sailor, salty as the sea and bright as the sun. “Over there is a man on the board of directors. We will talk to him.” She called to her son, “Vini Ricardo.” And the three of us went out to talk to the man on the board of directors. All told, they were happy to help me. Yes, I can use their address. They would even like to have a going away party for me. Everything is going to work out. In Rome, I stayed in a hostel. I slept in a room with five bunk beds and not much space in between them. If everyone’s luggage took up as much space as my duffle bag, then there would have been no room to walk. Attached, a bathroom oozed sweat and urine. A small window looked over a constantly congested Roman street. The window was left open to alleviate the hot damp of the room and the sounds of traffic floated in at all hours. Every bed had a traveler. Two Peruvian physicists were in the corner opposite mine. They were on a break from school and happy to chat about the pressures of academia. There was a girl from England and a girl from Maine. They wore nice dresses that danced with their cheerful dispositions, spent lots of time putting on makeup, and were English scholars and teachers soon to begin working together in Italy. The one from Maine had hair so golden that when she left the room it seemed like the sun had set. The bed under mine was occupied by a French fellow who spoke only French. He was good looking and sprayed cologne into his underpants just in case there was any doubt. When he heard I was going to Naples, he went to great pains to try to tell me where I should stay and where to get good cheap wine. Next to him slept the Spaniard. The Spaniard was a dark petite girl with long flowing black wavy hair. She spoke only Spanish and kept offering me cookies, a gesture that needed no translation. She was very persistent. Eventually, The Spaniard came back and was glad to see her friend despite the wild goose chase. The excited back-and-forth catching up made Spanish sound like a language full of joy and warmth. The Brazilian wore short shorts with aplomb. She had dark skin and dark eyes that seemed to stretch towards the sides of her face like a purring cat. Also not a great English speaker, but she worked hard at friendly conversation and big smiles. She waved her beer can about while communicating with her hands. The Blonde came back up the stairs with a bottle of wine and a Czech guy who decided she was worth following. The wine was opened and the Czech brought out his phone to let the jazz loose. The sounds of an upbeat throaty woman’s voice and a tenor sax blended with those from the street below as the wine was passed around. Different languages and different conversations melded in a surreal celebration of youth and life. Who was going to follow whom to which bar tonight? Some cool people knew about fun secret places. Phone numbers were exchanged. Stories were told and travels were reminisced while a joint was shared. Then some were off to here and others to there and the magic left the room. I try to go to sleep early so that I’ll have a good sleep cycle ready for my expedition. I don’t think I was ever very much fun. The festival of Sukkot is time of celebration and so I celebrated with the Jewish community of Rome. Without any prompting I was invited into people's homes and the ritual huts for meals and good company. I sat in a sukkah, ritual hut, on a terrace that looked over rome and mountains to the south. I was at a table with the four most recent generations of a Jewish Roman family. The great grandfather had drawn the colorful sketches of fruit and scenery that covered the walls. I worked a little on my Italian but the hospitable family went to great lengths to try to understand my English. The light filtered through the thatch roof to create a relaxed meld of sun and shade. Lazy bees tried to get at the buffet, and were thwarted by the screen that had been laid over it. The mother went out and one of her sons instructed me to ask for a particular Italian dish in Italian as part of some family joke. Ha ha ha, everybody laughed. Apparently I had asked for a Roman meat dish that cooked under the heat of the sun and is everybody’s favorite, but only available in the summer. The food was exceptional. Everything was traditional Roman cuisine which apparently is best in the Jewish community. The Jews came to Rome over two thousand years ago and adopted the local foods within the guidelines of our own dietary regulations. In more recent times, as Rome took up foods from other parts of Italy and the world, the Jews have stuck to the old ways. Traditional Roman food is yummy, unfortunately not knowing very much else about it I am unable to describe it; so I asked my hostess for the recipes and hopefully they will soon be posted here, possibly in Italian. As all good things, the time came when the happy conversation ended, I pushed one last cookie into my puffed out stomach, and the table was cleared. I was sorry to leave their kind hospitality. The Roman Jewish community was the most welcoming of all those I have visited in Europe. I look forward to the day when my travels bring me back there. Towards the end of my last trip I met a wonderful fellow named Alberto here in Italy. Hopefully, he still has the same email address because I'm trying to enlist his help with getting my kayak to Naples. I’ve arrived in Rome. Old buildings are everywhere and ancient buildings common. Statues and stone carvings, towers and castles winged by buttresses, enormous arches with magnificent ancient carvings and monoliths with latin and hieroglyphics, cathedrals and ruins abound. I saw an ancient ruin of a buildings arches, 50 feet high at least, with a newer set of apartments built on top of them that are only a couple hundred years old. In Scandinavia, almost no one smokes and bicycles are common. Here, many people smoke and the streets are choked with cars. The city smells a little like exhaust. The streets are crowded with locals and tourists from all over the world. Most street corners offers a view of some beautifully cut stone work or a picturesque neighborhood. Crossing the street at a crosswalk is a tricky thing. The drivers don’t seem very enthusiastic about stopping for pedestrians. I’ve found the best way to do it is to just go and try to ignore them. I call this technique - ostrich crossing. When I last left Italy, I had grown so used to Italian I was dreaming in it. But I’ve forgotten most of what I’ve learned and now I’m relearning it. I’ve run most of the errands I need to here in Rome: replacing my GPS, getting gas for my stove, shopping for food, and getting an adaptor. On Sunday I’ll be moving on to Naples where things are cheaper and I’ll stay until October 1, the new promised delivery date for my kayak. Gothenburg is a beautiful city. Downtown small shops line twisting pedestrian streets. Trees grow all over the city, bike paths line most of the roads, and trains run down the wide avenues. Two rivers flow through the central area. One is lined by parks and the other by wide cobblestone avenues and old four story buildings loaded with stores. Frequent stone bridges give the waterways the character of a sophisticated metropolitan who knows how to appreciate the vast forests and hills that surround the city. I ran in those forests and hills almost every day, usually for one and half to three hours. The first time I went beyond the paved paths, I was totally lost after an hour. My innate sense of direction that I had been relying on told me that I was just about where I wanted to be. I left the woods and found myself in a small village with small houses that were squeezed between mountains. I ran on a bike path and saw a young blonde man walking a dog and enjoying the clear sunny weather. “You want to go where? !” he asked me. I explained to him that I lived right near the zoo with the moose and the seals and the penguins. “That's a long ways from here. You'll have to go through the forest.” German fairy tales notwithstanding, I thought that would be a fine way to go. “Follow the signs that point to the botanical gardens.” At major intersections, the trails in the woods had signs. As I started to head back to the woods, he called out to me “Botaniska.” So I followed the signs and after half an hour or so of running I recognized where I was and another 20 minutes had me home. After that, whenever I got lost--and I tried to get lost often--when I had enough trail running, I would follow the signs to Botaniska. Yesterday, I saw a deer in the woods. Usually I'd see some other joggers and a few people out with dogs. The woods have lots of evergreen trees and plenty of deciduous as well. On the top of a mountain, there's a broad expanse of big stones and short flowery shrubs that affords a view of Gothenberg and the enormous bridges over the mile-wide river along the north edge of the city. The temperature is dropping and my hands got pretty numb on my last run. The air is crisp and smells like fall as the leaves change color, ushering winter in. I expect these trails will soon be covered by snow. Animal tracks will speak of the life that is there when people are not, and ski tracks will be freshly carved with regularity. And I will be kayaking on the Mediterranean. I am on my way to Italy, and hopefully will meet my kayak there in the next few days. So far, it is only a week and a half past the deadline that Nelo promised, which is what I was kind of expecting. 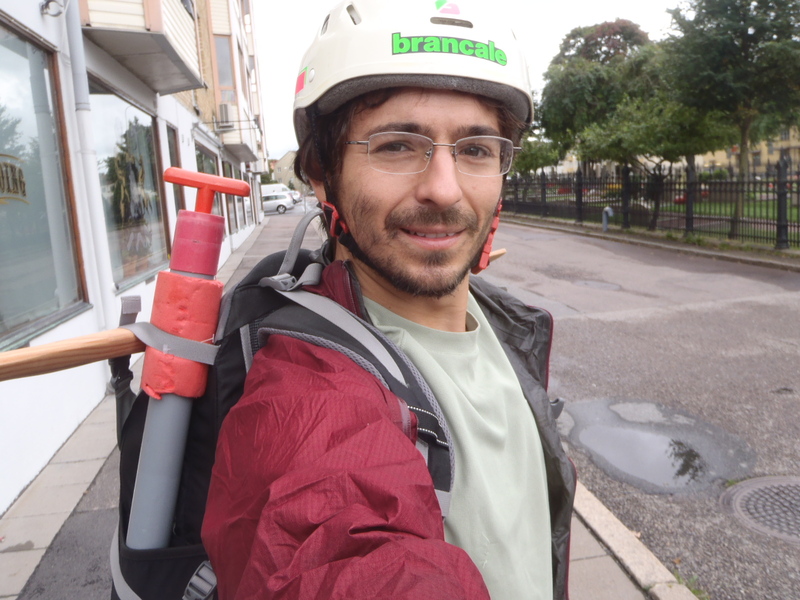 Yesterday morning, I loaded my kayaking gear into my day pack, tied my six foot paddle horizontally onto the back in decapitation form, strapped on my helmet and began biking towards Bildal to meet a new friend and a boat. My instructions were simple: Bike across the zoo with the moose to the highway*. Follow the path along the right side of the highway. Continue along the path when it veers away from the highway. Follow it along the coast. After one hour, arrive at destination. After passing through the zoo, I arrived at a gas station and stopped to put air in my tires. There was no air pump. 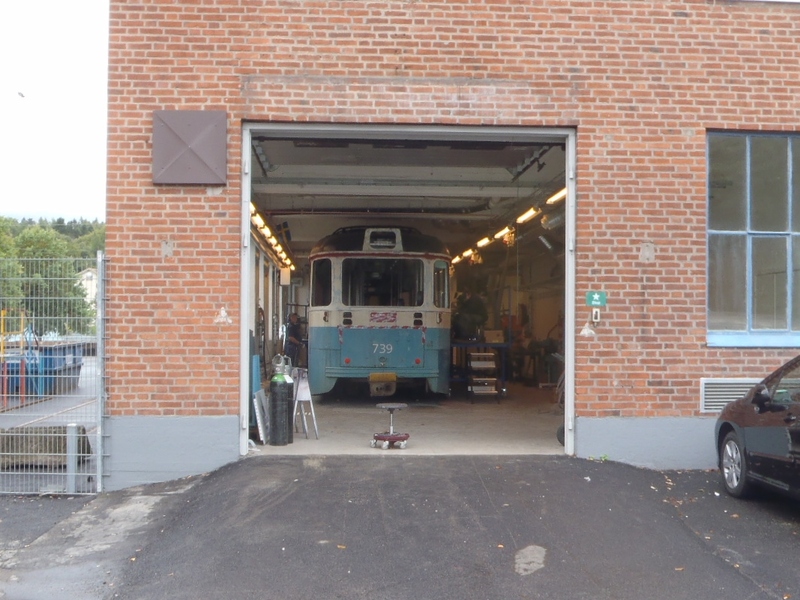 But there was a garage and in it a couple of guys were fixing a train. One of them was going at it with a welder and I watched for a few moments as sparks flew everywhere. He went and got a hose. We chatted some in English as I inflated my tires. I thanked him for being friendly and helpful, and then headed over to the path along the highway. The bike path was perfect. It ran straight to where I needed to go like the highway did, but was largely separated from the loud, ugly, varmint killing, moose bashing, polluting thoroughfare by a narrow but heavy wood. For a time, I couldn’t even see the highway at all. Then the path turned sharply to a tunnel under it. Oh no! My instructions were to remain on the right side of the highway. But there was no path on right side, only the one that went under. On the other side of the highway there was an intersection in the bike path. I could go to the right, along the left side of the highway, or to the left, presumably back towards Gothenburg. So I tried biking on the path on the left side of the highway, but it turned away after just a few moments and I was soon hopelessly lost in suburban Sweden. I steered wide around pedestrians and other cyclists, so as not to hit them with the paddle that was reaching out like wings on either side of my bike. At a busy intersection I found a short, round Asian woman who spoke to me in Swedish. She pulled out her phone to help me, and set me in the right direction. I found myself back at the spot where the bike tunnel went under the highway. So I tried again. I got to the intersection under the tunnel and again took a right. Walking in the opposite direction along the bike path was an older fellow with dark skin and white hair. Wearing a windbreaker and sweat pants, he was out for his daily walk. “Bildall?” I asked pointing the way that I was going along the left side of the highway. He didn’t understand. So I tried a few more times changing my inflection and accent until my pronunciation was close enough. “Oh, Bildall!” He said, pleased that we were understanding each other. He pointed back the way I had come. “[Come with me]” he motioned, waving with his hand. Back at the intersection at the tunnel’s exit, he showed me a sign with the names of towns on it and arrows. He told me which towns on the sign Bildall was between. He was sending me the way that I thought was back to Gothenburg. I had trouble believing what he was telling me. I doubted I had passed Billdal. But he insisted, so I paid attention to his hard work at English and went the way he showed me. After a few minutes of pedaling, I looked up at the sky. It was noon and the sun wasn’t that far from the horizon —directly ahead of me. I was going south, towards Bildall. The highway that I passed under must not have been the one I was trying to follow. The bike path veered away from the highways through a town and then along the coast. I stopped to take some pictures. Islands carved and calmed the blue sea. Forests, boulders and even horses gave the land definition and character. There was almost no obvious intrusion of man beyond the bike path and the marinas, whose sailboats seemed to be natural creatures with lives of their own. I was surrounded by wild coastal beauty of a kind and magnitude that does not exist in the overly developed places where I have lived. I arrived at my destination. A house, set back from the road by a long driveway between other homes, distinguished itself with a trailer loaded three high and four wide with kayaks. My host’s father came down the path to greet me enthusiastically. The grandfather of two carried an enormous load of pruned green branches on his shoulder. He showed me the kayak, a Tahe Greenland T, that I had been invited to use. With lots of smiles, he set me up with a chart and a spray skirt, told me where to put in and that I should have a good time. I geared up, put the Tahe on my shoulder, and walked the hundred meters to the water. I had four hours to paddle on my own before joining my host and a group of novices for a tour. The boat behaved beautifully. It turned when I edged it and went straight when I didn’t. It’s not as fast as my Nelo Inuk, but it’s close and handles like a dream. All white with sharp curves, it's also pretty. I needed to roll it. It was a new boat for me, and If I was going to feel comfortable, then I needed to roll it, once on each side. I stuck my hand in the water to feel the temperature. It felt like I was in Sweden. I hesitated, then rolled twice. It’s the easiest boat I have ever rolled. I was cold. But it was a sunny day and as I began to paddle, I warmed up. I paddled between islands and found more islands. The archipelago was a maze. Past every corner was a view of waters snaking between rocky, grassy hills. With only a turn of the head, a whole other set of forested islands appeared. Herons, geese, swans, and ducks hopped off of boulders rising from the sea as I approached. And then there’d be another island that would stand out because the sea cut through the middle of it like a lightning bolt, a particularly high precipice covered in dark green moss, or a small little shack that looked as though it had been standing there since time immemorial. I got out to climb to the top of particularly tall island. While exiting my boat, I put my hand on a rock to steady myself. I heard a sound between a squeak and hiss as I saw, out of the corner of my eye, something scurry away from the rock. I yanked my hand back, but the creature, whatever it was, was gone. I climbed to the top, over boulders and around bushes, and surveyed the thick archipelago around me. It was unlike any natural beauty I had ever seen. Jellyfish bobbed everywhere. I slid my Greenland storm paddle - this is the small one I built myself, and with each stroke I adjust my grip from one end of the paddle to the other - into the water and half way through the stroke the paddle stabbed a sponge. I must have hit a jellyfish. The blade rose from the water and I slid my hands to the just submerged blade to prep for the next stroke on the other side. I gripped jelly goo. On one island there was a small red shack and an old man sat outside of it. He didn’t speak a word of English, but I communicated easily enough my request that he take a picture of me by holding up the camera and saying “click.” He fiddled around with the digital camera for a while, trying to look through the lens that wasn’t there and not seeing the screen, probably on account of the glare. I suspect he had never used a digital camera before. Eventually, he pointed it vaguely in the right direction and pressed the button to turn it off. I thanked him graciously and told him the picture was perfect as he handed the camera back to me. I appreciated his effort and felt bad that my camera was too confusing for him. Then I paddled to my put-in and got out to go meet my host back at the house. As I walked, I saw some blackberries that weren’t quite ripe yet and a blue, almost grape-like fruit that looked tasty. It wasn’t on a vine, so probably not a grape. Still, I thought I had better try it to check if it was tasty, or poisonous. The fruit were sweet and bitter. I didn’t keel over and die. When I did meet my host, Mikael, he welcomed me warmly. We chatted about kayaking in the area, kayaks, paddles, and some of the kayaking superstars he’d met over the years. He showed me his traditional style carbon fiber Greenland paddle and even let me try it when we were on the water. It was very light and smooth, but a little awkward as I was used to the feel of my homemade storm paddle. 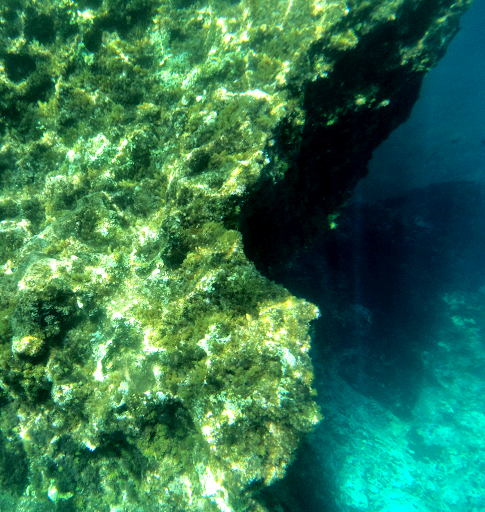 I switched back, and was soon slimed by another jellyfish. My wrists were red and irritated. The jellyfish slime was probably poisonous and dripping down my arms. I tried to ignore it. Confound it, I like my storm paddle and am sticking with it. Out on the water, Mikael invited me to help teach the inexperienced paddlers the tour and I was pleased to offer forward stroke pointers. Mikael guided us through some impressive crevices to some of the more fascinating islands. We took a break on a crescent island and snacked while admiring a rainbow in the distance. The sun set. We paddled back, put the boats away, and my day was over. Well, I still had to bike back, and in the dark after decent people weren’t out anymore, I got lost. There was nobody to ask directions. I went the wrong way for a while before I found a sign that said “Goteborg”. I followed it to another sign, and then after a while another, and eventually I arrived home. Thank you so much Mikael for one of the best paddles I’ve ever had. *Editor: Moose in Sweden know how to bike? Best biking partner ever! You’re just not a fish. I don't know when my boat will arrive in Naples. Originally I was assures September 9th; that no longer seems realistic. Today I ran on trails in the woods outside of the city and went for a walk downtown. I took some beautiful pictures, or rather, pictures that would have been beautiful if my lens wasn't so filthy. So, for the first time since I bought this camera and began taking pictures for this blog three years ago, I cleaned my lens with something other than my finger: soap. Meanwhile, I may have made a local contact who will lend me a boat. I went for a bike ride down by the water. I biked until the path ended, and then on a little more before I turned around. I took some pictures, and saw someone in the sky watching me. I don't know why. I’m visiting with family in Gothenburg. My wonderful host is a long lost Swedish cousin, Alex, who we met a few years ago in America and since then he’s visited with my folks a few times. I’ve spent the time here working on some of the logistics for my trip, going over charts, measuring crossing distances, verifying port locations, replacing my GPS that broke after only one outing, trying to make sure my kayak will arrive in Naples on time* and even doing a little bit of exploring. I visited with my cousin’s family, his brother and mother who are, by the transitive property of relations, my family too. Alex’s brother Marek was happy to help me saw my new paddle down to size** and tell me about the time he met a drunken moose***. Marek’s son is a race car driver. Mom, if you’re reading this, please know that you don’t have it so bad after all. The young man, of about twenty or so, was happy to show me the different kinds of racing cars they had in their driveway. Next we went to visit Alex’s mother, Dorota, who greeted me with a big hug in a way that seemed very Neimand and welcomed me into her home with fresh apples off the tree in back. She was 16 when the Nazis invaided her home in Poland. They fled and she was separated from her parents for an unknown amount of time before they found each other and made their way to the Soviets who sent them to cut wood in Vologda in the Russian north. During that time Alex’s father was fighting the Nazis in the scorched earth brigade. That is, as the Russians were retreating, he torched the farm land so the Nazis wouldn’t get the crops. They survived starvation and Russian cannibalism before they made it back to Poland, where she became a dentist and later an anesthesiologist and he a professor in thermodynamics. Years later, as Alex grew to a young adult and met with state sponsored antisemitism at every turn, he decided to dodge the draft and repatriated to Sweden with his family . Now, in 2013, my family is here. And I know some of what they’ve been up too since my own branch in the family tree left for the United States in the 1890’s. The last couple of days, I’ve been running in a heavily wooded park and free zoo just five minutes from Alex’s house. The woods have a very northern feel and smell like the beginning of fall. The zoo has moose and seals and penguins. The buildings here in Gothenburg are old, from the 1&00s and have stone details delicately carved into window frames, around the doors, and basically anywhere the design artists had a chance. Around them are newer buildings replacing those old works of art that were unable to survive the years. Fortunately, the rule here is that new buildings have to fit in, so while they don’t have the attention to detail that I love, they don’t stand out in the way that many of the modern buildings in Oslo did. Gothenburg is a beautiful old city. * Not optimistic, despite repeated promises made months ago. **Paddle shafts sometimes come in an all purpose size that’s good for very tall people, but it’s easy to fix. ***Moose get drunk off of fermented apples.